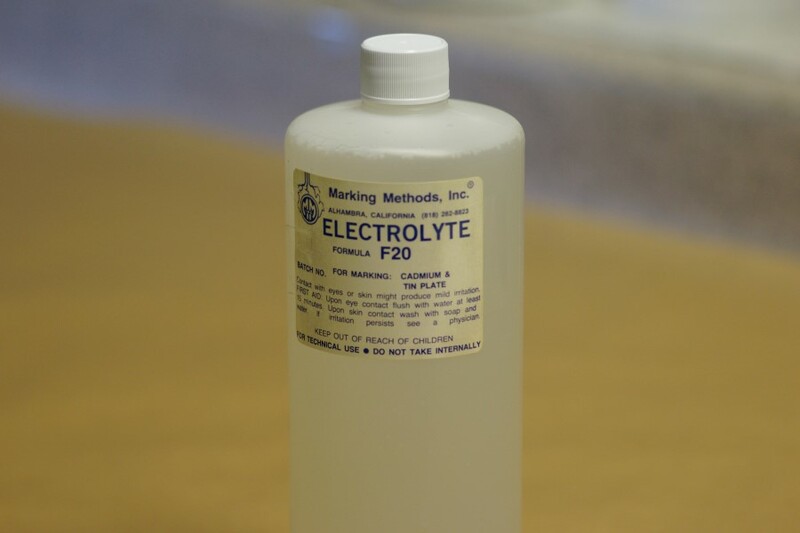 MARKING METHODS' laboratory controlled Electrolytes are the result of many years of research and development. They are carefully formatted and cataloged by formula and batch number to mark various metals and surface treatments. See the back of the parts catalog for the correct Electrolyte for your application. 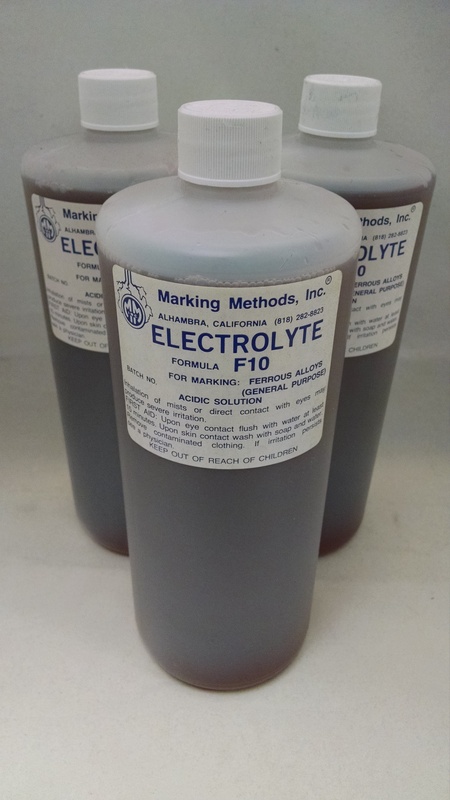 MARKING METHODS Electrolytes are buffered salt solutions, pH balanced and are completely harmless to parts and surrounding equipment when used as directed. They contain certain metallic salts, wetting agents, and in most cases, ingredients to keep the metallic oxides in suspension to prevent them from clogging the stencil apertures. It is impossible to over emphasize the importance of cleaning parts AFTER marking. This is necessary to remove the Electroylte remaining on the part, as well as the excess oxides from the mark itself. If this residue is not removed by either a vigorous wiping action with the cleaner or allowing the marked parts to soak in the cleaner for at least 5 to 10 minutes, corrosion will occur. A popular misconception is that actual etching into the metal will continue if the part is not cleaned immediatly. This is not correct. However, the Electrolyte residue, because it is hydroscopic, will absorb moisture from the atmosphere and cause corrosion, especially to highly corrosive steel alloys that must normally be kept in an oiled condition to prevent rusting. In such extreme cases, the best procedure to follow is (1) pre-clean parts, (2) mark, (3) thoroughly clean with cleaner, (4) dry parts, and (5) apply protective oil film before packaging or storing them. Remember all instances of rusting or corrosion can be traced back to an improper cleaning procedure. Two very popular cleaning solutions, OIC (Oil Immersion Cleaner) and APC (Bottle and Wipes) have been formulated to avoid any corrosion problems.